All of the specs and more pictures will be on http://www.EXCELARMS.com in a few days. I have contacted them, and I am very excited to see more firearms chambered in 5.7. Great looking rifle and pistol. My only qualm is the very limited mag capacity. I can see where patent issues would come into play over the p90 type top loading magazine though, so I understand. 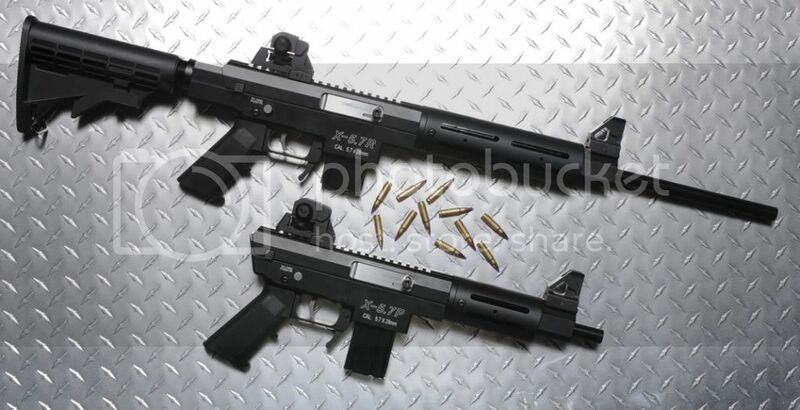 I'm really glad more firearms are being made in 5.7x28. The more the better. I have hopes that this cartridge will become a lot more popular so that the price of ammo will go down and more manufacturers will start making it. Those look pretty sweet, I'd definitely be interested if the price is right. And let's see a new sponsor! No reason why the AR versions could not use the FsM mag. I don't understand why they would want it to use fsn mags, if they make their own proprietary mag, they make more money selling mags. True on the mags; in my humble opinion, not considering money to be made off mags, the 50 round top loading mag is a very efficient and compact design already. I'd really like to see the reliability, durability, and accuracy of these new rifles when the tests are run. An upper utilizing a AR-15 lower would by far be ideal. Price is a huge factor as always as well. It seems the $1700-$2000 P90 is suffering badly right now; I think that may have been caused in part by the AR57 since one can be built for half the price of a P90 and it has cheaper/easier to find/replace parts--who knows! Like I said, the more 5.7 guns made, the better!!! What we need now is another ammunition manufacturer making 5.7 ammo. Perhaps if there were a proliferation of 5.7 eating rifles and pistols, then there would be a decent market for some ammo manufacturers to get into. This is my hope at least. jmz5 wrote: I don't understand why they would want it to use fsn mags, if they make their own proprietary mag, they make more money selling mags. Because 9 round mags will be a no starter with this crowed and will hurt them in sales. I REALLY like that pistol. If it is priced any where near your 22LR version, count me in for one. WOW. I am super excited. I am looking foreword to side by side testing of the pistols with the vids put up on youtube. Same platforms so it will be great to finally be able to deal a nice mouth full of STFU to all the "It's only a 22mag" crowd. panzermk2 wrote: No reason why the AR versions could not use the FsM mag. A companion 5.7 carbine using an FsN mag would be awesome, and I'd definitely buy one. A 5.7 upper to an AR lower using the FsN mag would replace 2 of my long guns. However, from my investigating into such an animal, the feed angle of the FsN mag makes it a poor choice for a rifle unless fed thru the pistol grip like the HiPoints. What is the price tag on these? Looking forward to seeing the specs on your site soon. THANKS FOR ALL THE INTREST!! 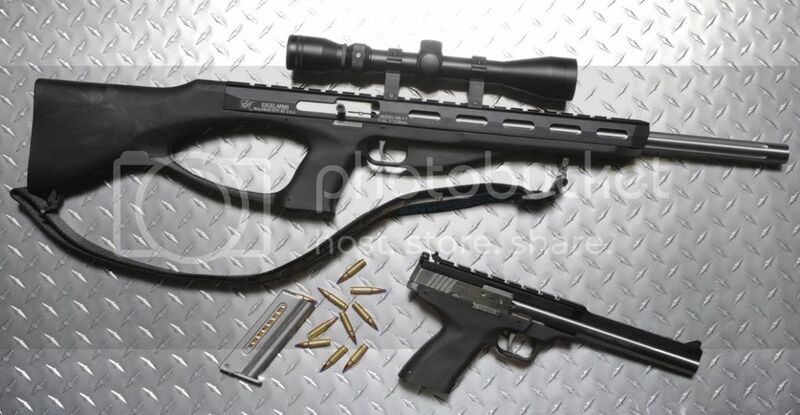 EXCEL ARMS will be introducing the new products at the 2010 NASGW show next week.. The X SERIES line magazines have a capacity of 25 Rounds or a 10 Round. ACCELERATOR line has a 9 round capacity do to fitting this cal. into a existing format. Your prices are much too reasonable. Please don't fix this problem. Looks very impressive. Glad to see someone making a gun platform in 5.7 beside FN It should be pretty interesting to see the accuracy rating of these. Good price point!--looks like you may just get a good foot in the door on the 5.7 market! =) I built my AR57 for $850 for basics not including the magpul BUIS, rail covers, optics, etc. So there's a definite price advantage in comparison. Still a capacity issue. Sure 50 rounds are not necessarily "Needed", but the AR57 sold so well because of the novelty of the top loading 50 round magazine since people "want" it. "Want"= the majority of demand--- Need does not necessarily=Want, but Want is always >Need in the market. Ever consider experimenting with quad-stack mags? That might be a "cool factor" that would increase sales. I definitely would want at least 30 round mags--I love going hog/coyote hunting with a 50 round mag and not having to reload the entire day! I have yet to need more than 30 for a day--usually 30 is the standard. On a much more practical level, I would definitely like to see a stand alone upper that can use a standard AR15 lower and either a magwell block for this mag type, or a new style of magazine that fits the regular AR-15 magwell. I like how a fluted heavy SS barrel was used on the Accelerator though. Overall, I'm impressed. Testing is the final step--if everything checks out with reliability and durability, I may just have to get one of those myself at that price. I'm guessing that price includes the iron sights? or not?